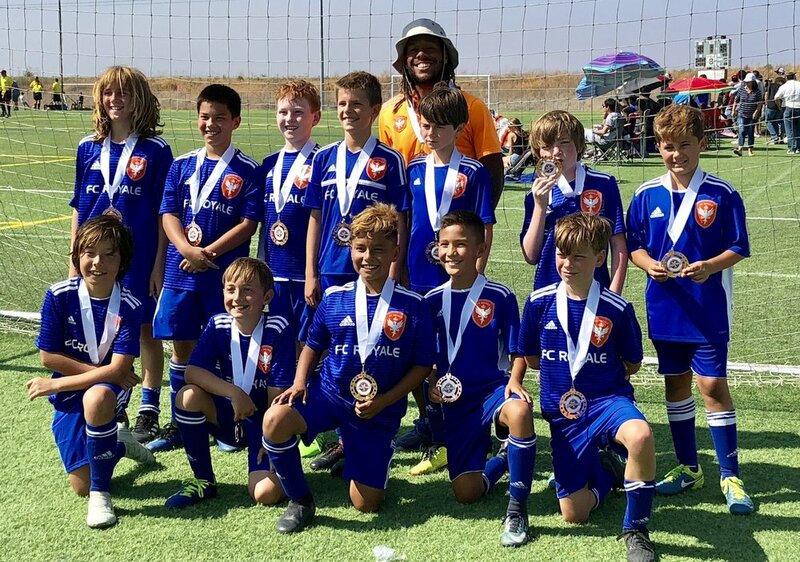 07B Orange recently took part in the 30th Wine Country Classic hosted by Napa United. It proved to be an eventful weekend. Held at Oakland Raiders pre-season practice facilities, the boys got to play on near ideal grass pitches. They started with an effective 3-0 victory over Briceno Mustangs with goals from Adrian Cano(2), and August Lehman. The second game of the day was an entertaining 3-3 draw against Napa Sport. Goals came from Adrian, Zhivan Khaleeli, and Desi Johnson. This concluded a good opening day, with the Orange team top of the group. Sunday morning proved a much tougher test. Orange played against the highest ranked team they have ever faced, Napa 1839 Academy, #5 in Northern California, and #23 in the US (gulp). Ultimately the class difference showed in a 0-7 loss. The MVP by far was Anthony Bocog in goal. His acrobatics and quick reflexes at least halved the score line. As a team the boys showed impressive attitude and continued running, chasing, tackling, and blocking the impressive opponents. A 3rd Place Playoff spot was secured. In a truly exciting game, Orange quickly fell 0-2 behind #34 ranked Yuba Sutter FC. Orange kept plugging away and grabbed one back (Tony McGrath) just on halftime. The second half saw a back and forth between the sides as legs tired. Luca Hrvatin and Blake Komater both went close. In the final minute Zhivan picked up a long ball, muscled out a defender and rifled a shot. The keeper saved with two defenders and Tony diving for the loose ball. A swing of the foot and Orange equalized on the final whistle. Penalties. The fight back proved a step too far and YS closed out the penalties quickly. It was an emotional end to a terrific weekend. Packed with learning experiences and a lot of fun for the players and families. FC Royale 09B Dragons Win Stanford Tournament! FC Royale 07B Blue Take 3rd at Stanford Tournament! FC Royale 07B Orange Win SF Tournament!